This review of the Koolehaoda monopod includes larger than life photos so you can experience a larger than life review of this accessory. All kidding aside, let's take a look at this monopod to see if it's any good. 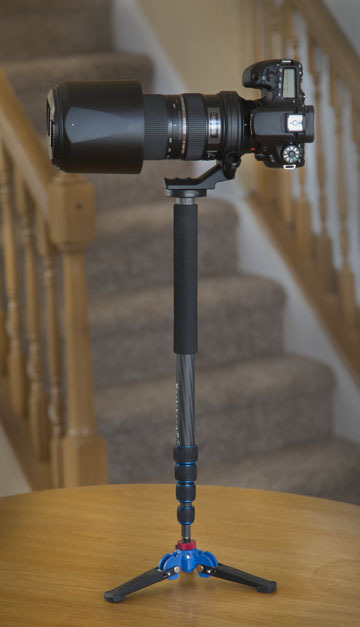 This 65 inch carbon fiber monopod is versatile to use in a variety of photographic and video situations. With a Canon compact DSLR and 150-600 lens. It is a good, middle-of-the-road monopod that should satisfy the needs of many still and video photographers. Monopods with feet add stability for still photos. You can get silky smooth in and out video camera movements by using two of the three feet as contact points with the ground. WEIGHT. It's light as a feather. Okay I exaggerate but when I pulled it out of the packaging I almost giggled. Weighing in at only about 13 ounces (without the feet attached), initially I though I received the wrong item. You see I picked it out after an extensive search, reading reviews and opinions on several web sites. I knew its size and weight numbers, but until you actually have it in your hands, it's tough to know exactly how the weight, or lack thereof, feels. PRICE. You'll like the price tag. Carbon fiber poles are usually priced pretty high. That plus the fact that it comes with the feet makes it a good value for you. VERSATILITY. 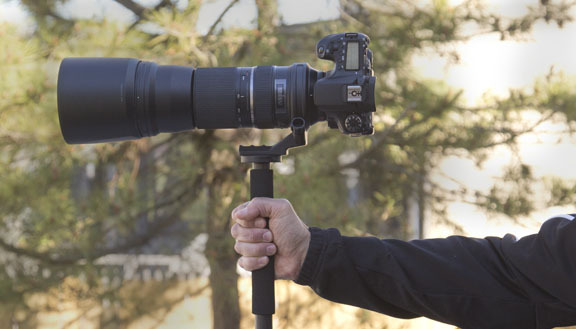 You can use it as a stand alone monopod for sports or wildlife photography. Just screw on the feet and you've got a good base for shooting stable video and smoother panning. Additionally, the quality of the folding feet was impressive for an accessory coming in at this price point. They feel solid in your hands, click smartly into position, and screw on securely with a 3/8 inch bolt. A few of the buyers who reviewed this monopod didn't realize that you can adjust the tension on the ball and complained that it was either too loose or too tight. 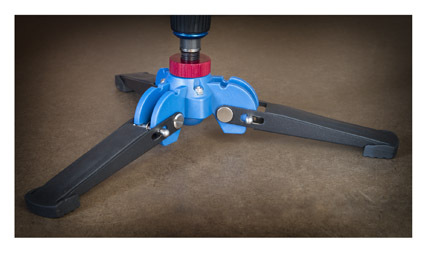 The monopod comes with a hex wrench to adjust the tension. If you have already used a monopod extensively then you'll likely agree that your user experience with a monopod like the Koolehaoda depends quite a bit on exactly how you are using it. It is far superior to the $15 models sold by Dolica and Amazon in terms of the workmanship, materials, and functionality. It is not nearly as rock solid as the best monopods by Manfrotto or Gitzo. 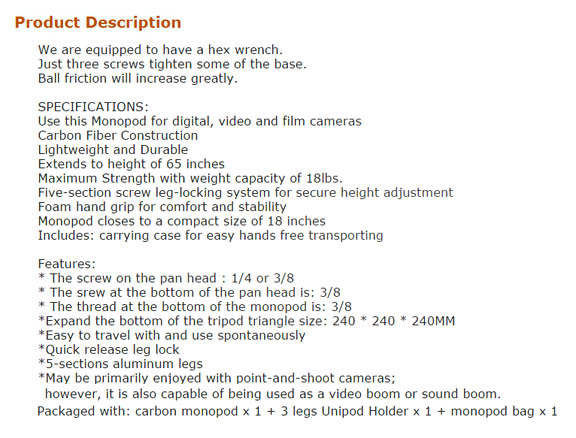 Here is the product description that every review of the Koorhoada monopod should include. I have one final comment to to dd to my review of the Koolehaoda Monopod. Although it has three legs that are somewhat can lock into position, I recommend that you never wander away from your monopod with camera mounted on top. If you are on a level, flat, hard surface you can briefly take your hand off, but the slightest wind or tilt and disaster is only 2 seconds away. 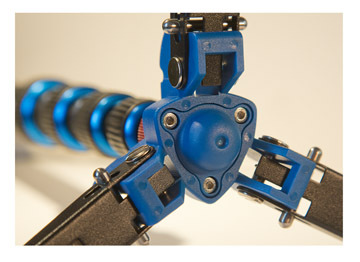 The 3 mini legs add stability, but monopods with feet are not intended to be left unattended.